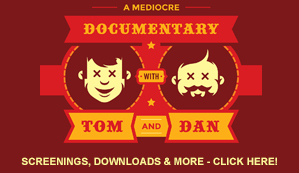 There’s just way too much going on in the “A Mediocre Time with Tom and Dan” camp! Much of it, you know of — Tom’s about to have a baby, our 5 year anniversary is about 3 weeks away, we’re in the middle of planning one of the bi-annual BDM private parties, and I’m obsessed with making upgrades to the TomandDan.com website, the MediocreApp, and to our studio. And as with everything, it’s all money. Mics, mixing consoles, computer parts, it’s all cash. But I will tell you that being out on our own and able to make all of our own business and financial decisions independently is pretty damned awesome. 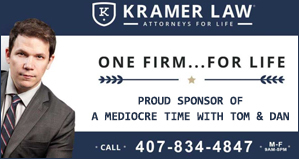 I’m not going to lie, it’s a ton of work especially since we don’t have a massive institution underwriting anything that we plan or do but it’s a hell of a lot more fun to doing it on our own. We’re no strangers to hard work. It’s what we did for the past 10 or 15 years except this time we’re the ones reaping all of the benefits of said work. Planning and securing venues involve meetings, meetings and more meetings. Trust me when I tell you that I think you’re really going to love what we have planned for the next BDM Members party. If we can pull it off, it will certainly be the best BDM party we’ve ever planned and all of you members are really going to love it! I’ve teased this before but we are working on a few other things that are top secret and we’re hoping to be able to bring you up to speed on all of those as soon as possible. We promise that you will be the first to know and we think you’re really going to like how the show is growing and our attempts to make it better while still providing you with quality and original content.